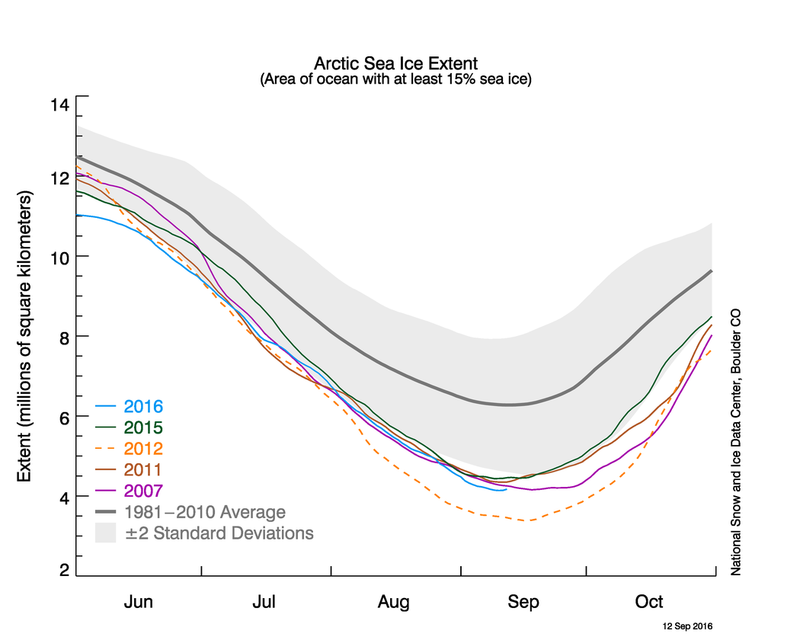 It is that time of the year again – in late summer and early fall the media is covering the Arctic sea ice extent. Whether it is another record-breaking low like 2005, 2007, or 2012, or in second place, like this year (see for example New York Times, Guardian), the news is not good. And again, we hear many speculations on when we will start to experience an ice-free Arctic Ocean during summertime. Will it be 2030, 2050? Are we stuck in keeping track and recording, observing the change, how fast or slow it is from year to another? Or is something different this year? I believe that yes, there is a bit of a difference – and a bit more hope. We are in the post-Paris climate agreement (COP21) and UN Sustainable Development Goals (SDG) world. Today, 48% of 196 nations have formally bound their governments to the Paris agreement, and it is anticipated that by the end of the year, the required 55 nations responsible for 55% of emissions globally will have formally committed to the Paris agreement. This is when the agreement takes legal force, although implementation is another issue and a new story. I attend scientific meetings, and meetings gathering science, policy, and business stakeholders. Way too often when I attend those meetings, the participants again state that we must do this and we must do that, but they are not prepared to give concrete help and concrete suggestions. They do not talk about the possibility to commit themselves to anything other than stating the need or supervising the statement of needs, leaving the planning of implementation and search for resources happily to some unnamed others. 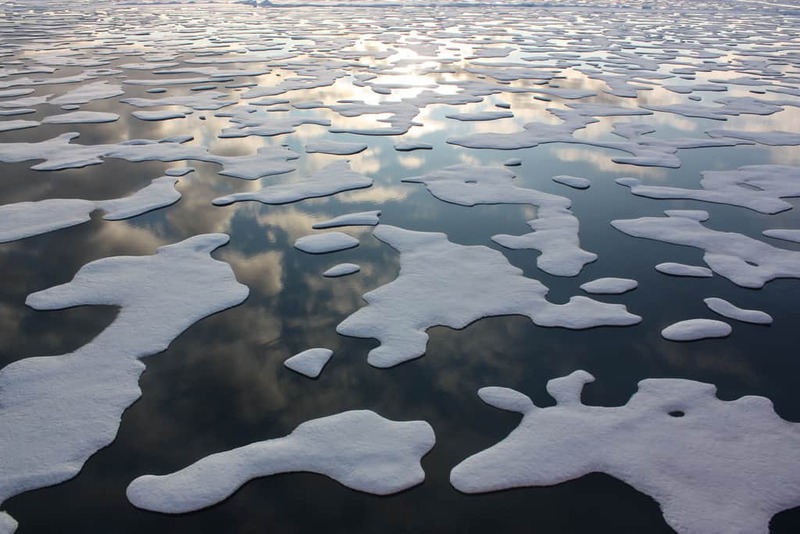 The Arctic today is in the spotlight not just in the sense that the world’s attention is briefly focused there: it is melting fast under the effect of a variety of physical forces that concentrate warming in the Arctic region. What could we do to help cool the Arctic more quickly? Reducing greenhouse gas emissions through agreements and voluntary implementation by nations, ramping up the use of renewable energy sources and developing new technology, and then waiting for greenhouse gases to decrease in the atmosphere–this will all take a long time. And it will be much longer before we experience the impacts of the emissions reductions. But in parallel to these slow but indispensable developments, there are faster ways of helping out the Arctic in particular. And as a co-benefit, we can clean the air, improve our health, helping the rest of the world as well. About 25% of the current warming of the Arctic is attributed to black carbon, that is, soot coming from incomplete combustion of fossil fuels. The main culprit for the man-made black carbon in the Arctic surface atmosphere is gas flaring, wasteful burning of gas in the oil and gas industry. Gas flaring has been found to contribute to 42% of the annual mean black carbon surface concentrations in the Arctic, hence dominating the black carbon emissions north of 66oN. A large part of the warming experienced in the Arctic is due to black carbon emissions from the eight Arctic nations and the region north of approximately 40oN, including European Union, Russia, Ukraine, China, Canada, and part of the USA. The USA and Canada have agreed to end routine gas flaring by 2030. My hope is that the IIASA Arctic Futures Initiative could get together science, policy and business stakeholders from the Arctic nations in order to tackle this problem, with other concerned parties, and with countries not yet involved in discussions. Stohl, A., Aamaas, B., Amann, M., et. al. (2015). Evaluating the climate and air quality impacts of short-lived pollutants, Atmos. Chem. Phys., 15, 10529-10566, doi:10.5194/acp-15-10529-2015, 2015.